The Soehnle Professional Babyscale 7725 is a two-range scalewith high precision and reliability suitable for hospital use (approved class III, MGP class I). The damping and hold function guarantee a stabile weight indication. 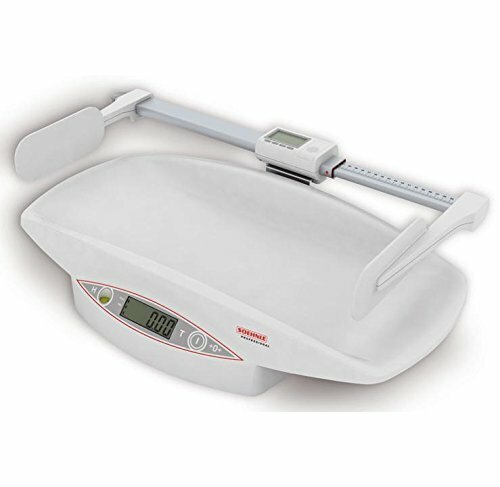 Another advantage of the babyscale is its high stability for save weighing of our babies.Easy to clean plastic and ergonomic forms without chamfers andcomponents allow a simple and hygenic cleaning.- High-contrast LCD display with 20 mm high figures- Large reading angle- Automatic zeroing at switch-on- Tare function key (laid on pad can be tared)- Hold function- Mains or battery operation ; Capacity: 15 kg; Sensitivity: 2 g up to 6 kg, 5 g from 6 kg up; Dimensions: 60 x 35 x 12 cm; Weight: 4.6 kg; Operating voltage: 220-235 V/50-60 Hz or rechargrable batteries; Made in Germanyy 1 pc.